Ōtomo no Yakamochi was an 8th century waka poet and statesman who lived during the Nara period of Japanese history. This covered the years 710-794 and was when Empress Gemmei established the capital of the country in the city that is now known as Nara for all but five years (740-745). Yakamochi belongs to an elite group of writers known as the Thirty Six Poetry Immortals. There are no records to confirm his date of birth but it is believed that it was circa the year 718. His family belonged to the prestigious Ōtomo warrior clan who had the honour of providing the personal guard for the imperial family. Yakamochi grew up writing poetry and, no doubt making use of his family connections, was appointed to the governorship of Etchū province for a five-year period from 745. It is believed that some of his best poetry was written at this time and some 220 waka poems have been attributed to his name by this time. 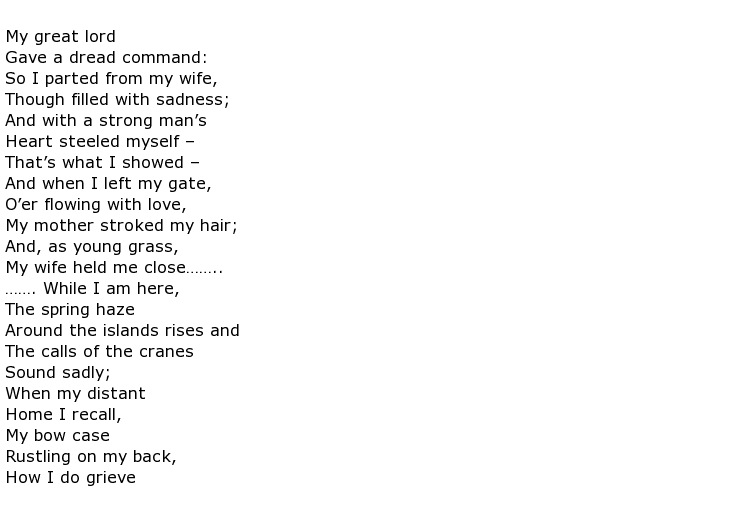 He seems to have been prolific in his writing up to the year 759 which was when his last known poem was published. After that he dedicated himself to the compilation of the Man’yōshū, the greatest imperial anthology of Japanese poetry. 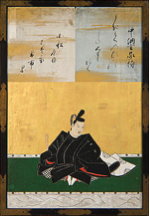 This is the first known collection of Japanese poetry and includes a good number of his own poems, possibly as much as ten per cent of the total. Yakamochi made a good career for himself as a bureaucrat, filling governor posts in a number of provinces and finally rising to the position of chūnagon which was the highest level that he could attain. He also served time as a military commander, helping to suppress rebellions and keep his sovereign safe. There were occasions, though, where suspicion fell upon him with regard to assassination plots and the like, which resulted in his career taking occasional setbacks. One in particular, concerning a nobleman called Fujiwara no Tanetsugu, ultimately brought him disgrace. Shortly after Yakamochi’s death by drowning Fujiwara no Tanetsugu was assassinated. Because of previous suspicions about his involvement in this plot he was denied the burial that he should have had as a high-ranking bureaucrat. The state posthumously excommunicated him and his name was disgraced, along with that of his son who was forced into exile and temporarily stripped of his own rank. Ōtomo no Yakamochi died on the 5th October 785 at the age of 67.